You are an artist and your little one’s nursery is the canvas. Every work of art has a focal point, a centerpiece, a special item that inspires the entire masterpiece. Your work of art needs a crib – a splendid treasure to attract the eye the minute you walk into the room. Sleigh Cribs, Round Cribs, Canopy Cribs, Heirloom Cribs… No matter your style – classic or bold – we’ve got an entire palette of stunning choices to make your nursery a true work of art. Sweep your baby off to dreamland with a stunning new crib. We, at Baby Crib Boutique, believe in making the world a prettier place and we do it one nursery at a time. We believe that a nursery is more than just a place to sleep. It’s a place to grow, to dream, to giggle and play. Baby Crib Boutique is the place to be, when you’re looking for a baby crib that’s beautiful, inspiring, practical and safe. Baby Crib Boutique is the world’s first choice for the finest baby furnishings. With hundreds of styles and tens of colors – it’s easy to find a crib you’ll love. Shop Classic Crib and you’ll find a collection that takes classic to a new level. Shop heirloom masterpieces boasting intricate carvings, stunning sleigh cribs with striking silhouettes, and traditional Canopy Cribs, oh, what old world charm. Don’t forget our contemporary cribs – they’re a new vision for a new generation. Shop Round Cribs and find uniquely shaped cribs showcasing gorgeous hand painted designs. 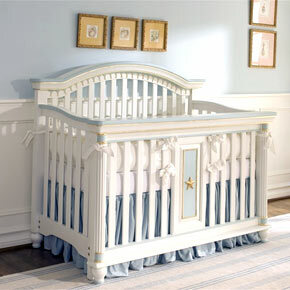 Shop Convertible Cribs and find cribs that will never be outgrown. Shop Iron Cribs, Portable Baby Cribs and more… Baby Crib Boutique has a stunner to suite your style. And if the dizzying effect of countless colors and styles intimidate you, call us; we’re more than ready to help you. We are here to share this special time with you. We’ll help you peruse the choices, decipher the differences and we’ll even send you wood samples. Take your time… Explore the possiblilities… and find something wonderful for your precious new bundle.